Thank you to Yummi Pouch for providing me with product, free of charge, in exchange for my honest review. All thoughts shared are my own. The majority of our lives are spent on the go. As soon as we're up and ready each morning, we're out the door- on the way to school, and then onto after school activities until it's time to get home for dinner and homework. We almost never get snacks out somewhere. I am a big fan of bringing along snacks from home, but really dislike the idea of carrying around bulky containers or wasting plastic baggies that just get thrown away- what a waste of money! Our friends at Yummi Pouch gave us the opportunity to check out their reusable snack bag sets. You may know Yummi Pouch for their reusable pouches- fill them yourself, wash them out, and reuse them! Revelae Kids also falls under the Yummi Pouch umbrella of products, and offers up reusable cloth snack and sandwich bags. We received a set of three cloth snack bags in the Flashy Set, which I thought B would totally love. I really dislike handing over plastic zip bags filled with snacks. They are flimsy, and I have weird hangups about thin plastics. 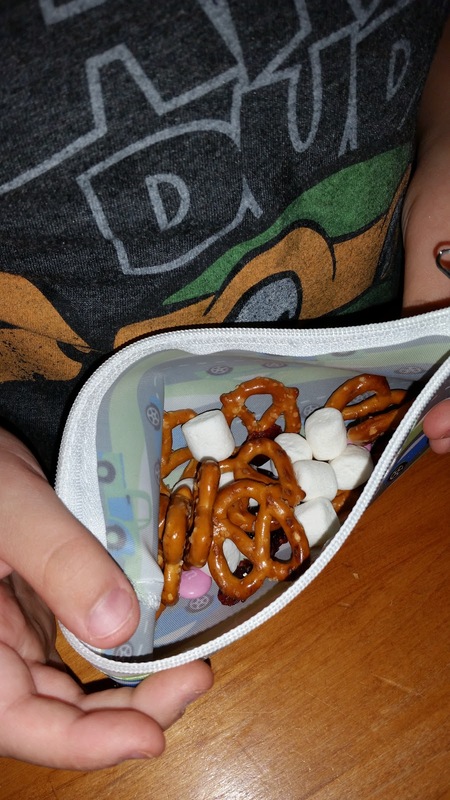 The snack bags are made of a durable cloth, and can be washed and reused time and time again. Take snacks on the go with Yummi Pouch cloth snack bags. Our snack bags are lined with a moisture resistant interior and decorated with colorful prints. Perfect for crackers, chips, and dry snacks. 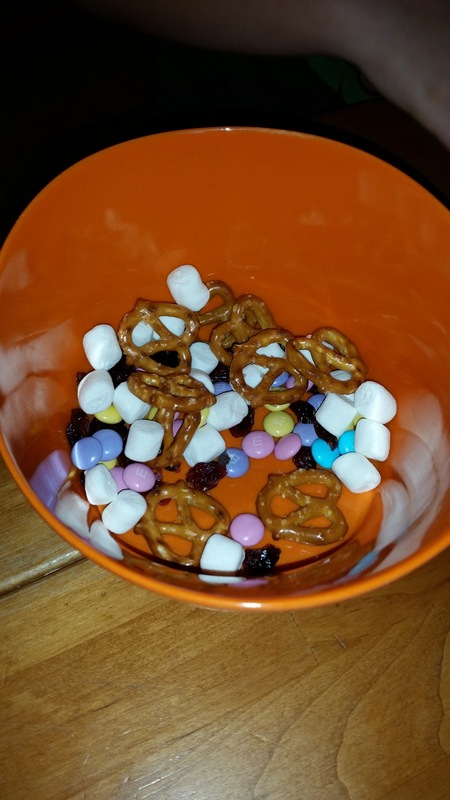 Take a look at the power snack we made, using some of B's Easter candies! 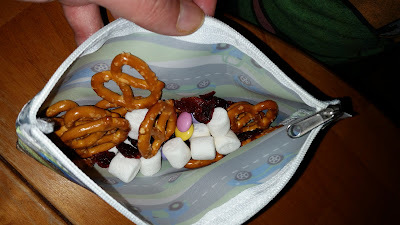 B had a great idea to use some of his Easter M&M's in a snack mix. I am fine with him having a few pieces of the chocolate, when mixed with other food. I asked B what we should put into the snack mix, and he offered up the suggestion of using pretzels, dried cranberries, the M&M pieces. and some mini marshmallows. B made the snack mix himself, scooping a handful of each ingredient and them mixing them together in a bowl. He was excited to grab a handful and put it into one of the cloth snack bags. He also grabbed an extra bag and prepared a snack for mommy! I love that these cloth bags zip closed. I don't have to play a guessing game as to whether or not the bag actually gets sealed, and my son can open and close it by himself. The fun and colorful styles of the snack bags actually make eating snacks from home more exciting. There's been zero whining over the snacks we've had since we've received these cute snack bags. B can't wait to look in and see what he got! One of the other wonderful features of these bags, is that they can either be hand washed, or washed in the washing machine or dishwasher. I like to load them into the dishwasher, on the top rack, and then they're clean and ready to go for the next use. These are perfect to toss into a backpack, a purse or diaper bag, or into a lunch box. 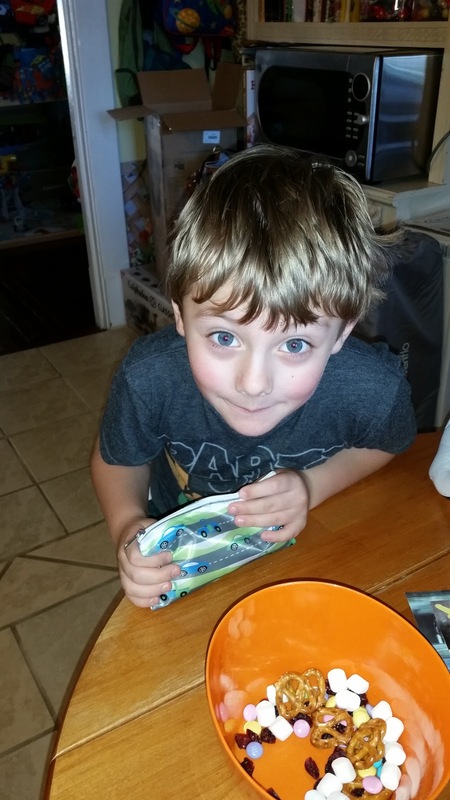 B stays at school for lunch one day a week, and we'll enjoy being able to include a few surprises in the snack bags. I definitely want to purchase the sandwich bags, as well. They can be used for lunches or larger snacks. There are lots of cute styles/sets of the reusable cloth snack and sandwich bags available from Yummi Pouch. Be sure to check them all out over at Revelae.com. Connect with Yummi Pouch on Facebook, Twitter, Instagram and Pinterest. 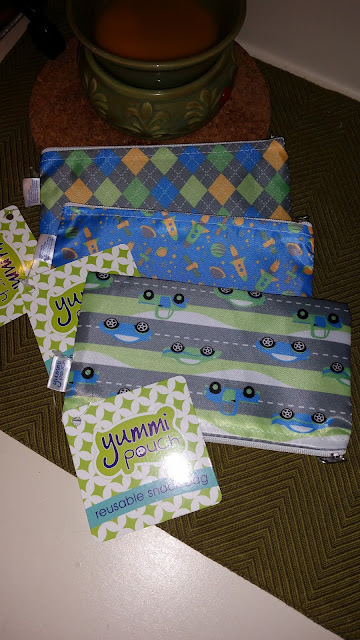 Special thanks to Yummi Pouch for allowing us to try and share about their awesome reusable snack bags! We think they're winners!